Does Food Affect Acne ? : Free Healthcare and Fitness Ideas Does Food Affect Acne ? Does Food Affect Acne ? How What You Eat Affect Your Acne? Someone sent this questions wanting to know if nutrition can actually affect acne or if what we eat affect acne. So, I'm providing answer to this questions using this brief update which i believe you will gain a lot from it as you read on. Acne is a disease of the skin which may probably stay on the skin for over a long period with lot of skin irritation but many people believe that acne is cause by the food we eat/consume which means we can reduce it by avoiding some food items too. How true? 1. Fats and Sugars: If you want to reduce your acne through the food we eat, its not really confirmed that fat and sugar are the causes of acne but fat and sugar cause overall problems in the body including skin problems like acne. Since, fat and sugar does not have vitamins in them, its good to avoid them because too much of oil causes skin problems which acne is one of them. Oils and sugar when reduced also can reduce the chance of you gettting this skin disease called acne. 2. Junks Food: Junks food that does have any nutritional values especially for adult which means you are doing more harm to your skin when you eat junks food. 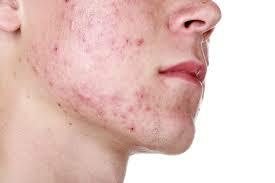 Acne get worse when you eat lot of junks food which means you need to avoid eating these food. 3. Organic Foods: You will notice a considerable good skin when you eat in moderation some organic food containing vegetables and fruits. If you eat more fruits and vegetables there are chances that you cant have skin diseases like acne because fruits contains various vitamins and minerals that help the skin and also prevents rashes, acne from the skin. 4. Water: If your body lacks water, you stand a chance of getting skin related problems like acne but when you drink more water, you get hydrated and you skin will remain fresh, smooth and healthy. Its required of us to drink close to 7 glasses of water everyday for the overall body health including the skin. So if you are noticing some changes in your body or skin such as dryness, hitching, rash, then drink some water and you will see it vanish within the shortest period of time. I believe you can now see that the food we eat can affect or cause some skin related problems and we need to avoid such but to eat more food items that helps the body some which includes fruits, vegetables, water etc. If you have other questions or suggestion on this topic, feel free to contact us or use the comment box below for quick responds to your questions. Thanks for reading.